(Seattle, WA) January 18, 2012 SBS Imports and the Seattle Beer Collective are pleased to announce the expansion of their successful Cider Summit festival to Chicago, IL. The inaugural Chicago event will take place on Saturday, February 9, 2013 from 11am-7pm in the Lakeview Terrace Room at Navy Pier. The event will benefit The Great Lakes Cider & Perry Association, WBEZ Public Radio, and Heartland Alliance. The owners and cidermakers will be on hand to inform and guide guests through the samplings which will be available in 3-ounce and 6-ounce portions. Cider Summit will feature over 60 ciders from throughout the U.S., England, Scotland, France, Spain, and even New Zealand.. The event selections are now posted at: www.cidersummit.com. The event will also feature specially selected food pairings from Fortune Gourmet. Tickets are $20 in advance and $25 (cash only) at the door and are available online via Brown Paper tickets (www.brownpapertickets.com/event/292749) and at the Hotel Palomar concierge desk. Admission includes a tasting glass and 10 drink tickets. Additional drink tickets will be available for sale onsite at $2 per ticket. The event is 21 and over only. 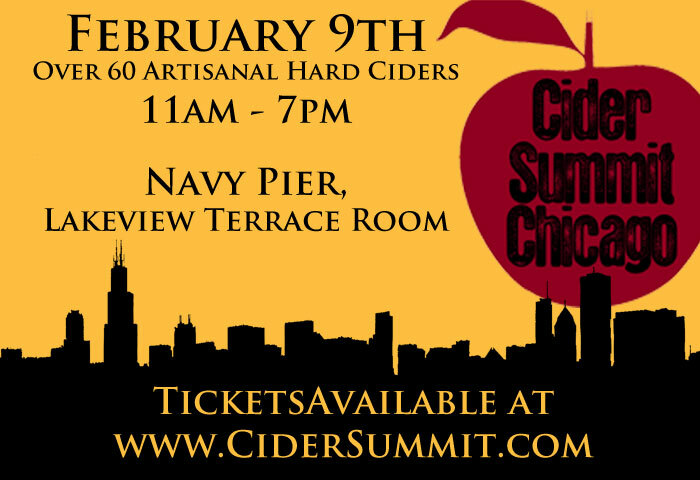 Cider Summit sponsors include Binny’s Beverage Depot, Hotel Palomar, Chicago Brew Bus, and River North Sales & Service. Media support is provided by Chicago Reader and WBEZ Public Radio.